On a recent jaunt around town, your faithful e-publisher happened across a curious object in a remote corner of a strip mall parking lot: a large depository box, of the type usually used for the collection of old clothes for various charities. This particular receptacle, however, was not intended to recycle people’s cast-off duds in order to raise funds for the widows of blind artists or deaf composers. 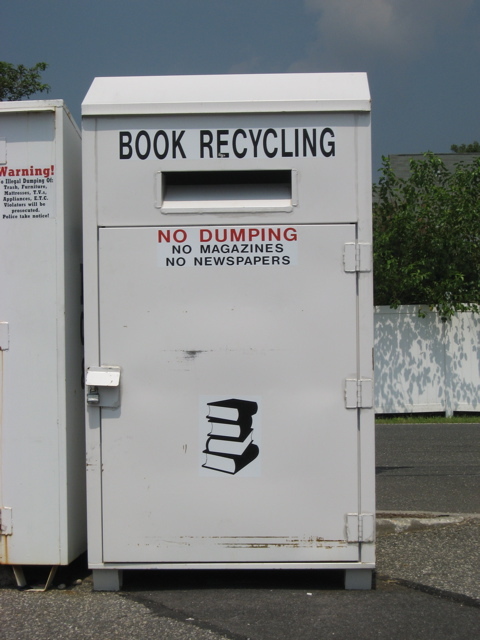 Its purpose was spelled out in stern, stencil-like letters: BOOK RECYCLING. Below, there was an icon of a pile of hardcover books and, in red, the statement NO DUMPING; then in smaller letters, NO MAGAZINES/NO NEWSPAPERS. I will admit to feeling a strange twinge on encountering this semiotic indicator of contemporary literary degeneration. Taking its stated purpose at face value, it seemed to suggest that books=junk (though perhaps a superior echelon of junk to magazines, newspapers, or actual refuse). All joking aside, I couldn’t help wondering what sort of books deserved to be “recycled” and which retained, and who was qualified to make that judgement — not to mention whether most, if any, users of the book recycling box were aware of — or even cared about — such distinctions. As a publisher focusing exclusively on electronic editions, I found the book recycling box both fascinating and yet depressing. If its existence indicated that printed books are viewed as increasingly worthless, what might that suggest about literacy today? On the other hand, perhaps an increase in the recycling of unwanted volumes points to a public shift from dead-tree media to electronics — in which case, I may be able to pay my rent more promptly in the near future. Either way, it’s a thought worth pondering. As I have responded to the occasional Luddite who questions (not always politely) my motives as an e-publisher, just because a book has finely-tooled morocco leather covers and handmade vellum pages doesn’t guarantee that it is well written, or even worth reading. Some of the most rousing literature I have known was smearily printed on newsprint-grade paper and roughly stapled into cheap paper covers that fell apart after one or two intent perusals. An old Zen adage comes to mind: The ultimate purpose of a book is to read it and throw it away. I love fine printing as much if not more than the next person, and I obviously love books themselves, or I wouldn’t have been a publisher for the last twenty-odd years, and a writer for more than forty. But the physical book is in a dramatic process of change and redefinition, and while there’s bound to be a downside to that process, it is also very exciting. As old forms evolve, new possibilities open up. I don’t personally believe that the printed page will ever disappear entirely, and that’s a good thing. Still, as I found myself thinking when I stumbled across the book recycling box, at this point in time, the writing is quite literally on the wall. 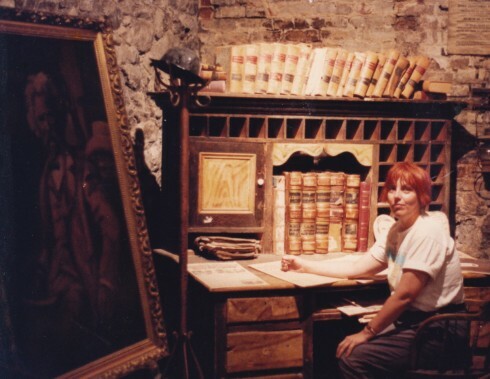 Our intrepid Publisher seated at Mark Twain’s (putative) desk in the basement of the Virginia City Enterprise building, Virginia City, Nevada. A lengthy search for the “office bottle” in the various pigeonholes of the desk had proven fruitless, hence the Publisher’s rather stern expression. In Spring 2011, I found myself — as I often have — unemployed, unfocused, subject to chilling if not entirely unexpected visits from the Nameless Dread by night. Due to the sagging economy, all of my attempts to secure editorial or publishing work had proven worse than futile. My second career, music, was similarly problematic because of drastic changes in the industry and my own reluctance, at the ostensibly dignified age of fifty-something, to play in toilets for peanuts. My literary agent had seemingly vanished from the face of the Earth, and I couldn’t say I blamed him: despite prolonged and agonizing efforts, it had become painfully obvious he was never going to unload a single one of my book projects even after selling his immortal soul. In short, the Universe had apparently seized a bullhorn and was announcing, to resounding disinterest, that I was ugly and my mother dressed me funny. It wasn’t as if I hadn’t confronted similar impasses before, but previously I’d managed to weather them by reinventing myself — for example, switching from non-paying musical pursuits to low-paying scrivening, or investigating witness protection programs. At this juncture, however, such disingenuous dodges seemed worn threadbare. Spiritually and financially, I was bankrupt, staring into the abyss, clueless. Out of desperation, my thoughts turned to my one business venture which could honestly be termed a success. This was a publishing company I had started with my then-husband, Lionel Rolfe, in the early 1990′s. We called it California Classics (clearly, we were in the grip of hubris), and for over a decade it miraculously survived earthquakes, homicidal authors/royalty disputes, changes of venue, and other vagaries. We published a few titles, gained a certain notoriety, and kept the dire wolf (all six hundred pounds of sin) more or less away from the door, before eventually receding into the sunset, perhaps even mourned by the one or two readers in Los Angeles. The obvious question was, could I go back, Jack, and do it again in 2011? Obviously, publishing had changed dramatically in the intervening two decades. In 1991, we had dealt strictly with “dead-tree media” — ink on pages, bound in covers. In 2011, media was increasingly electronic: flickering pixels on small screens. From the publishing standpoint, there were a number of advantages to this electronic approach: extremely low cost of production (the process of printing physical books carries a hefty price tag, whereas e-book production is downright cheap, if not free), massive distribution potential (virtually the entire world is online), the exciting concept of interactive media (psst, mister, wanna see some really dirty pixels?). Not that I was myself a consumer of electronic books — I didn’t own an e-book reader or even a smartphone, so I’d have a rather steep learning curve. But given my other options — punching a register at Target or slinging hash, if my back and knees held up — it seemed like a sufficiently intriguing prospect. You have to start somewhere. In my case, after considerable thought (about fifteen minutes’ worth), I decided to call my e-book publishing company AirStream Books. E-books exemplify the concept of instant gratification: they’re literally streamed through the air (if the publisher is lucky, this is presumably after electronic payment has been tendered) from the publisher to the reader — no need to waste time and gas on a physical encounter with one’s local bookstore. But I had another reason for choosing that name, as well. Familial mythology always hinted that I was conceived on a glorious night in an Airstream trailer. Call it a cosmic epiphany, if you will. On second thought, let’s not. I was lucky enough to convince California Classics’ former distributor to add AirStream to his list of publishers. I was elated. Now I could forge bravely ahead with my business plan. The first thing I realized was that I needed titles to publish. (I can’t figure out for the life of me why this realization struck me so belatedly, but as we all know, it’s not nice to make fun of the mentally challenged.) I decided to republish my own out-of-print books first, and follow up with some of California Classics’ better-selling titles. First off, I reprinted Cal Classics’ bestseller, my memoir Being Frank: My Time with Frank Zappa. Next came my biography, The Sagebrush Bohemian: Mark Twain’s Wild Years, and in close succession, my collaboration with comix artist emeritus Bill Griffith, Alfred Jarry: The Man with the Axe and Bread and Hyacinths: The Rise and Fall of Utopian Los Angeles, another classic. Finally, I added Cal Classics’ second bestseller, Lionel Rolfe’s Literary L.A. This led me to an interesting round of contemplation. As I delved into the fascinating world of e-publishing, I began to notice that many of the titles available for purchase were considerably shorter than what I considered to be “books”. People were now selling long articles, pamphlets, short stories, etc., and referring to them as e-books. I was concerned about this. What did it say about the attention spans of e-book readers, or for that matter of e-book authors? I also noticed something else, something analagous to what I’d observed in the music business some years back, when computer-based music software began to be readily available: suddenly everybody was a musician, and just as suddenly, there didn’t seem to be any listeners left — a conundrum which had essentially ended the musical profession, at least as regards profitability. Now, similarly, it seemed as if virtually overnight, every blogger on the internet had become an e-book author. Was quality publishing dead? No matter. Onward and upward. The next point of interest on my AirStream journey came when I had, after much labor, uploaded my first few e-titles. In conventional (perhaps we should refer to it at this point as “analog”) publishing, book sales depended on publicity. This was usually relatively simply, if not cheaply, achieved by hiring a perky publicist to chat up potential media outlets: publications, influential media figures, reviewers, broadcast outlets, and the like. But things are different now that anybody can be, and generally is, an author and/or a publisher. The most accepted, if not the easiest, way to drive traffic (to be honest, I prefer the older, more dignified term “encourage custom”) to one’s e-merchandise, is through the use of social media — Facebook, Twitter, and the countless other electronic watering holes where so many people squander their lives between hanging up their jackets and quitting time. I am not alone in having serious doubts about the sanity of social media. Here’s how Tim Kreider, one of the few true geniuses writing and publishing sociopolitical essays and comics today (hey, Tim, make a note of AirStream’s contact info, willya? I’d love to publish your next book once you’re sick and tired of being ripped off by the majors), described his own queasy odyssey into the netherworld of e-publicity: “I dutifully created a Facebook page, where I now Like things and am Liked in return, am sometimes Poked and wonder what being Poked signifies, and share important news with my Friends like ‘Sorry I haven’t posted in so long.’ I joined Goodreads, where I was instantly befriended by the other guy who’s read ‘The Origin of Consciousness in the Breakdown of the Bicameral Mind’. But I secretly drew a line in the sand at Twitter. Most prostitutes have their boundaries, and for me tweeting was the one act so degrading I had to quietly take it off the table. Despite all my efforts to make myself Liked, I still have only 700-some friends on Facebook, which makes me the Internet equivalent of what in the ancient Indian caste system was called a ‘dog eater’”. I created a Facebook page for AirStream as well as a Twitter account, which I figured could be used to publicize and support the main AirStream website. Like Tim Kreider, at first I was mortally abashed at the idea of condensing everything down to 140 characters in order to tweet on Twitter. I debated getting things off to a rousing start with a first post: “By the time you read this, I will have shot myself. Thanks for reading” (55 characters, not counting punctuation) — but I figured it would probably just eliminate what few followers I had. But business is business, and now I’m just as brazen and terse as the next attention-challenged tweeter. Unfortunately, everybody who subscribes to Twitter or Facebook seems to be so busy tweeting and/or Liking and/or posting mythical PhotoShopped images of themselves, that they evidently don’t have time to read other people’s tweets or posts. Entropy reigns supreme in social media, it seems.